I got your attention with the word impotence didn’t I? You must really be wondering where this post is going. Well, fear not, or this may disappoint you, but this will be a clean post. Rather, this post will use impotence in the light of the definition of impotent as lacking power or strength. I say unprecedented, well because its keeping with the theme of my blog, but also because I can’t really recall a similar scenario. I also say impotent because I truthfully can’t think of an easier win for our President. But he can’t or won’t pull it off. However, here are the facts. For months now, a Marine who served two tours in Afghanistan made a wrong turn into Mexico with his legally registered firearms has been held in a Mexican prison a few miles from the border. Honestly, I don’t even know it’s a few miles. He is in a prison in the city of Tecate, Mexico which hugs the US border. Its possible that if you were running a 5k, you could run into Mexico and give this Marine a high five before you would hit the first water station. But the United States, can’t or won’t get him out. We are going to start with the can’t part. You see, despite the fear mongering and partisan attacks Obama frequently attracts, I have never been one to believe the worst about him. I don’t think he is a socialist tyrant, I don’t think he wants to establish an American Caliphate, and I don’t think he is a lizard alien who plans to enslave mankind. Rather, I think he is just a liberal President doing what a liberal President said he would do. I think he will exit in 2 years and that will be that on this chapter in America. So if he is just a liberal President who wants what is best for American and just views the word in a liberal lens, then that leaves me to believe he just can’t do anything about this jailed Marine. However, this criticism will be limited to this issue as it is this issue I am passionate about. Neither supporting or undermining Obama weigh on my mind. I think we all can support this Marine and any President is able to totally wreck an issue, or in this case, fellow citizen. Actually, I thought the won’t do something is the worst scenario, but the more I think about it, the can’t part starts to bother me more. How is it, that the Nation with the mightiest economy and strongest influence can’t seem to do anything about a Marine combat vet jailed across the street from our border. Wasn’t the whole premise of the Monroe Doctrine to tell the world that this hemisphere is our area of influence so rest of the world back off? Do we not have any leverage against our neighbor? Do we not allow millions of undocumented workers and now children, see my earlier post, to remain in America and send money back to Mexico? How many times have crimes committed by immigrants in America resulted in a deportation that basically just says, your bad, now go back home? But we can’t seem to pull it off. 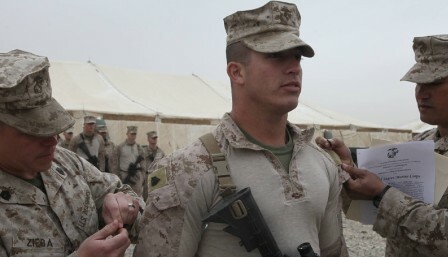 Yes, I get that Mexico is probably using this Marine as a bargaining chip of some sort. But what makes them think they can pull this off? At a time in our Nation’s history where Veterans are applauded for the past decade of sacrifice, this Vet can seem to get a little help from the supposed most Powerful man on the planet. In walks impotence. Really Mr. President, this is low hanging fruit. The conservatives are clamoring for this Marines release. It’s an easy win. Get on the phone with Mexico, exert a little Teddy Roosevelt and bring home this win. The same President ballsy enough to send Navy Seals unannounced into Pakistan to shoot Bin Laden in the face can’t seem to pull this off? Which leads us to won’t. In my disbelief that an American President can’t pull this off, I am only left with won’t. This next part is speculation. This is a blog, so think more editorial than research Wall Street Journal piece. I think maybe he won’t because it was a gun crime and we know what Obama thinks about guns. I think President Obama lacks sympathy for this Marine because the President has a poor view of gun ownership in America. Like a father whose child gets a speeding ticket, the President seems content to let this Marine languish in a Mexican prison, not to teach him specifically, but likely America a lesson on guns. Again, I don’t know that, but as a radical centrist who has never been inclined to think the worst of Obama, that is the only plausible scenario I can come up with. He lacks sympathy for the situation because this President feels it is a scenario of this Marine’s own doing. What a shame. Again, it should be an easy win for the President. Low hanging fruit, but won’t do it. Or possibly worse, can’t do it. Truthfully not sure which scenario I fear more. Even Bill Clinton while not President, was able to go to North Korea to bring home two journalist. NORTH KOREA! But Obama sent him you say, so he won’t send anyone across the border but he will send them to North Korea? Well then I say, lets send W in to save the day this time. In 2007 in Santiago, Chile, President Bush had his secret service body guards pushed aside by local security. So the President himself, pushed past Security and rescued his own secret service. Rescue is a strong word, but its still pretty awesome. Look it up on YouTube. But this Marine is within arms reach of the border. Mr. President please tell me that its not that you won’t do it, but even more please tell me that you can’t do it. For if so, this impotence would indeed be unprecedented.